McALLEN — What started as an idea by two Lamar Academy students to help classmates with basic food and hygiene needs is spreading throughout the district and helping open new doors for its creators. High school students Pablo Ramirez and Samantha Almaraz started a food and toiletries pantry at their McAllen ISD campus in 2018 with the hope that all students would feel free to take items as well as to donate. School officials agreed to have extra cafeteria food donated to the pantry, which is located in a retrofitted closet space on campus. The students place bins in several corners of the cafeteria during breakfast and students can then add any item that was served to them but they didn’t consume. Items such as juice and milk boxes, fruit, cereals and any packaged items can be stored in the pantry or in a refrigerator that they installed in the space. They also collect toiletries and canned foods for students to take home. But Ramirez said they have changed it to be more of a schoolwide-led initiative to get more people involved. For Kristine Garza, principal at Wilson Elementary, the idea seemed like a good addition to the food drives and donations that the school has adopted over the years. Not long ago Wilson Elementary switched from donating to city pantries to collecting their own donations and distributing them to their own families, due to an increase in need in the area, Garza said. So when the two students came to them with the Energy Bar idea, it was a no-brainer. Right now the food items for the families are available at the Wilson cafeteria, she said, but the staff if coming up with ideas of where to place the student focused pantry so that they can have easy access during the day. 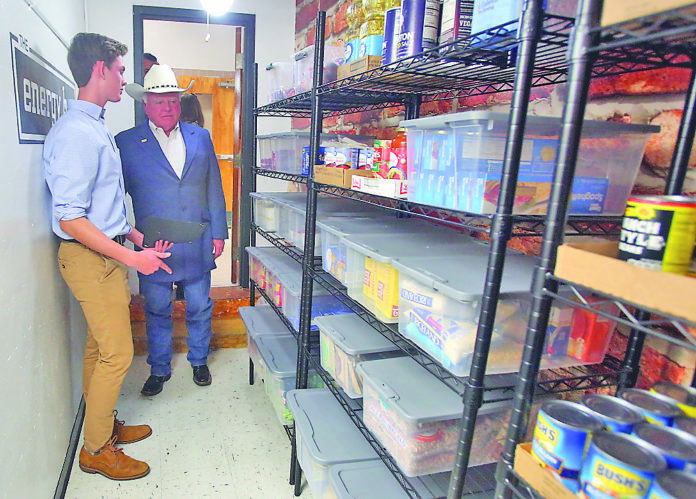 The two Lamar students said the district’s principals they have met with have been very receptive to the idea of implementing the pantry and they provided them with basic guidelines to help along the way. The students hope to see other younger generations adopt these types of projects they said, which have even opened doors for them to join bigger platforms. Ramirez, was recently accepted to be part of the Texas Department of Agriculture Health Ambassadors program and Texas Commissioner Sid Miller commended his efforts to fight hunger in his school. Now Ramirez will be part of a statewide group that seeks ways to end hunger by expanding programs that promote access. The 16-year-old said he hopes to learn from TDA and other students from across the country on how to address the needs of students from the Valley and also make them aware of the opportunities that exist on the region.